If you need help for addictions or other issues that keep you from you highest good, we welcome you, as well as anyone interested in learning more about this highly successful program of recovery and way of life. We are inclusive of all those who wish to live by spiritual principles as outlined in the text of Alcoholics Anonymous, also known as the "Big Book". Many of us have recovered by taking the Twelve Steps and continue helping others to recover by following the simple program of action revealed by the founders of A.A. If you have gone to groups, meetings, therapy and discussion meetings; if you feel confused and overwhelmed and are wondering why you're not getting better, we welcome you. We have found a new way of living. You can too. The Big Book tells us we are recovered but not cured: we have a “daily reprieve” as long as we continue working the twelve steps. This program is amazingly simple and effective, having assisted nearly 75% of its early members to recover from alcoholism. It has been the blueprint for thousands of other similar groups like ours. Yet success rates of A.A. and other recovery programs have plummeted. The problem, we believe, is that they have strayed from the original principles of the founders. Around the world, the "Primary Purpose" (PP) programs are returning to those ideals. Completely give ourselves to this simple Program. Be willing to go to any lengths for recovery. Be fearless and thorough in practicing these principles. Accept that there is no easier, softer way. Let go of our old ideas absolutely. Realize that half measures will not work. Ask God’s * protection and care with complete abandon. Become willing to grow along spiritual lines. We admit that we cannot manage our own lives (to our satisfaction), and that probably no human power can restore us to sanity, but “God”* (Spirit or Something Greater than us) can and will restore us if sought. In the Big Book, the term *"God" is explained as inclusive of many Spirit- ways-- eg., "God as we understand God." intended to impart to each of us based on their experience and knowledge of alcoholism and their Program of Recovery. It examines the content of virtually every sentence in that basic text. 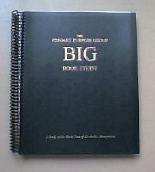 Primary Purpose Groups around the world offer meetings that closely adhere to the original intent and meaning of the Big Book and its Founders, the first 100 A.A.'s who were so successful. Many A.A. groups also use the name "Primary Purpose", but the ones in this closer following of the Big Book use the above Primary Purpose Big Book Study Guide. Live and recorded nationwide phone meetings open to anyone 24/7 ! The groups listed here consist mostly of A.A. members, but many of them will help anyone with any addictive problem; their meetings generally are inclusive of anyone interested. to study and stick very closely to the Big Book. Next Page: The Twelve Steps & "It Ain't in the Book!" This site is not affiliated with the entities of A.A. or other “Anonymous” programs. is for those who wish to stop compulsively acting out in addiction or problematic behaviors.